From the village of Neira in Colombia's central Caldas province, we survived a stormy ‘buseta’ trip and arrived in Marsella, a little ‘pueblo’ about 70km further south in the Risaralda province. What a spot! 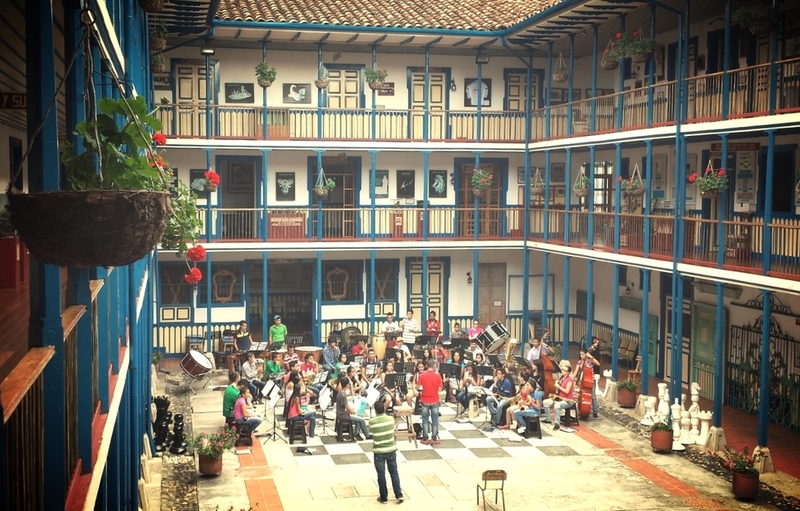 And we were lucky enough to stay in the Don Danilo Café/Hostel just a few steps away from the Casa de la Cultura, a well-preserved colonial house in Marsella that's home to the local youth orchestra and to many cultural activities. Don Danilo is a young business run by two brothers: Andres who does the promotion, and Mauricio in charge of roasting coffee in their small laboratory right beside the bar. It's a family business, named after their father, and they're very passionate about it. They represent the new generation of ‘cafeteros’, bringing an innovative and fresh approach to Colombian coffee. A key aim? Getting Colombians to appreciate their own excellent coffee, prepared well. We were told that because of the low prices Colombian co-operatives are paying for green coffee, the two brothers decided to change tack and sell their coffee directly to consumers. Now they carry out all the steps required to produce an excellent organic coffee, from 'finca to cup', constantly experimenting to obtain the best flavour. In Café Don Danilo you can taste their coffee prepared using a French press, dripper, presso or expresso machine. Our favourite was definitely the presso, a corkscrew-type gadget that gives an intense and creamy shot of coffee. And the good news is that the finca is just a few minutes away from the hostel so we had a very enjoyable afternoon walking through coffee trees while chatting with Julian, a young but very experienced ‘administrador’ who oversees the coffee growing. It's clear that the Don Danilo brothers have decided to focus on quality, adding value to their beans during the growing, roasting and preparation stages. We can only wish Andres and Mauricio all the best for their business, a real gem in the Eje Cafetero!